. إن York Hotel Kalgoorlie حريص على توفير الراحة للنزلاء، فلا يوفر الموظفون جهداً في تقديم أفضل الخدمات وضمان حسن الاستقبال. يقدم الفندق فرصة للاستمتاع بشريحة واسعة من الخدمات بما فيها: واي فاي مجاني في جميع الغرف, تخزين الأمتعة, واي فاي في المناطق العامة, صف السيارات, مطعم . يمكن للنزلاء الاختيار من ضمن مجموعة من الغرف المصممة بعناية لتعكس جواً من الراحة، والتي يتجاوز عددها 18. يقدم الفندق خدمات رائعة كمثل حمام سباحة خارجي لمساعدتك على الاسترخاء بعد نهار طويل من النشاط والتجوال في المدينة. اكتشف مزيجاً ساحراً من الخدمة الاحترافية والخيارات الواسعة من وسائل الراحة والمتعة في York Hotel Kalgoorlie. يُغلق مكتب الاستقبال ولا يمكن تسجيل الوصول عند تمام الساعة 10:00 مساءً. يُرجى العلم بأن الغرف لا تحتوي على مرافق خاصة. توجد حمامات منفصلة للرجال والسيدات في المنطقة الخلفية من الفندق. Staff are wonderful, as is the venue. The rooms are old, but truly beautiful, and the gorgeous little touches left by the staff make all the difference. I particularly love the privacy you get at The York. I've spent weeks staying at various budget accommodations, and privacy has been a big issue for me. The meals are also great value. Big in serving, and delicious in taste. The York may be budget accommodation, but you're certainly not made to feel that way, with staff being ever so caring and giving 5 star service. Ok this is an old historic building and that doesn't work with having en suite facilities and you have to wander down the corridor for them. However what the York Hotel does have is amazing architecture, owners who have brought it back to its former glory, beautiful staircase and caring staff!!! Loved the balcony for a cold pint of Fat Yak!!! The York Hotel abounds with classic beauty ( the staircase is a beautiful piece of work ). 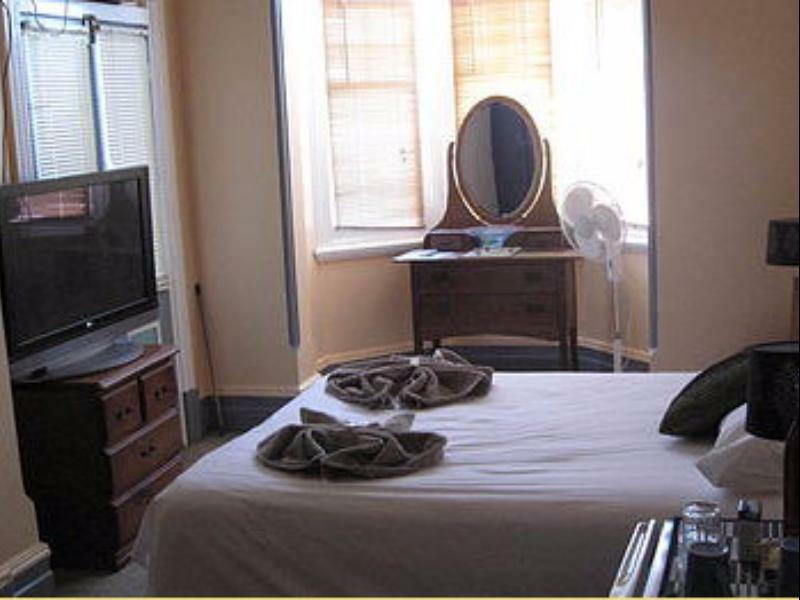 The hotel is well situated in the main street of Kalgoorlie, allowing easy access to explore the rest of the city. The staff were delightful and provided assistance if required. Everything was great. The in-house pet, an adorable, loving dog known as Metsy was the icing for me. Metsy was there each morning with a friendly greeting and wagging tail and every evening to say goodnight. Made it feel like home. Thank you. The hotel is a beautiful original hotel from the early days of Kalgoorlie. Rooms are clean and although there are no ensuites the shared bathrooms were clean and toiletries were provided. The staff were exceptionally friendly and helpful. Toilet was a fair walk but everything else was great. Nice old pub, good view of main street. Locals were restless though and could only park on the main street. The location and history of the building were key factors of why I rented a room here. Regrettably the Information Centre in Fremantle recommends another hotel that is very close to the train station. I would advise people to do some research or ask the Info Centre for other places to stay at. The price was discounted and better than what the Info Centre's suggestion and I stayed 2 nights. The bar downstairs has character, the food was good and my room had a balcony overlooking the town and sunrise and to boot, there is a pool in the back. Definitely cannot go wrong with this hotel. The York was fantastic, beautifully restored with decorative high ceilings, a grand staircase, large room, great dinner and breakfast, central location to shopping, very friendly staff, very clean, gracious hotel accomodation, will come again and recommend. Very Clean, Good service, good location. It was my fault for not realising at point of booking that my room did not come with an attached bathroom. But after I got over that I really began to enjoy the hotel with its excellent decor and overall service. I will return if the opportunity arises. Food, service, the price was fantastic. Will stay here again for sure! The staff were brilliant and went above and beyond to help me all you need to do is ask. Nice Hotel, beautiful food, when you book ,they should point out that there is no toilet or bathroom in your room, but overall friendly service and clean. Loved staying in this beautifully kept old hotel. The location was great and the staff were lovely. My room was next to the balcony with noisy patrons eating and drinking just on the other side of the wall from my bed. I had to be up at 4am so didn't really appreciate the front bedroom. Also the blinds let a lot of light into the room. I suppose it was my mistake not to check what I was going to get in the York Hotel, I was very surprised to find a very basic room without ensuite and not even a basin in the room. The location of the female toilets/showers was through an outside door onto a veranda and back into another corridor and it was bloody cold in there (my stay having been in the middle of winter). Comparing the size and number of the toilet and shower cubicles of the female facilities to the male ones, I must assume that this hotel mainly caters to males. But it was clean and the staff was friendly. This is a quirky heritage hotel where the focus is definitely on the dining rather than accommodation. I stayed two nights in August 2014. It isn't expensive and I knew before hand the bathroom was shared. However I discovered that the women's bathroom is on the landing outside on the 1st floor and only the toilets are lockable! There are few staff and reception (at the bar) was gruff and no frills eg I had to find someone (not easy) and get details for access to wifi the next day. Having said that the fare in the dining room is very good and it's a central place to stay with quirky, mostly heritage decor.